Goose problems range from damage to agricultural crops through both consummation and trampling. Golf courses and lawns suffer aesthetically from the aggressive and destructive presence of geese. The large bird droppings from Canada geese foul reservoirs and ponds, in addition to making a mess on green belts. Airport safety is jeopardized as many airport bird strike collisions result from geese roosting in open areas near airports. Yet we can’t do anything about it? The Migratory Bird Treaty Act (MBTA) provides federal legal protection for Canada geese. Protection under this act extends to bird feathers and other body parts, eggs and nests. Canada geese are also protected by Illinois laws. Non-lethal control such as repellents and frightening devices should be tried before a permit for removal will be issued. Translation: Big fines or jail time for intentionally hurting a goose. So put your guns, brooms, egg shakers and more away! Click HERE to learn about getting a permit if you have an really big PROVABLE problem. The National Humane Society says the best way to make these pests, who are extra angry/crazy during mating and chick season, is to use a trained dog. The most effective way to scare geese away is with trained goose-herding dogs. Herding dogs convince geese they are not safe from predators. This should only be done by specially trained dogs working with a handler. Dogs handled properly put geese in flight and the geese leave an area entirely. Handled improperly they may only put the birds in the water, where, if not pursued, they quickly learn the dog is not a real threat. Dogs must never catch or harm geese. And dogs must be well-treated and kept safe on the job as the valued employees they are. Hunters believe that Canadian geese are the smartest birds. Canada geese have very good eyesight. They can see more than 180 degrees horizontally and vertically which is very useful during flight. Canadian geese have a large lifespan. As an extreme, some can live up to twenty four years in the wild. However, most die within the first year of their life because of predators. In many cases concerning geese and birds, the voices of males and females are different. 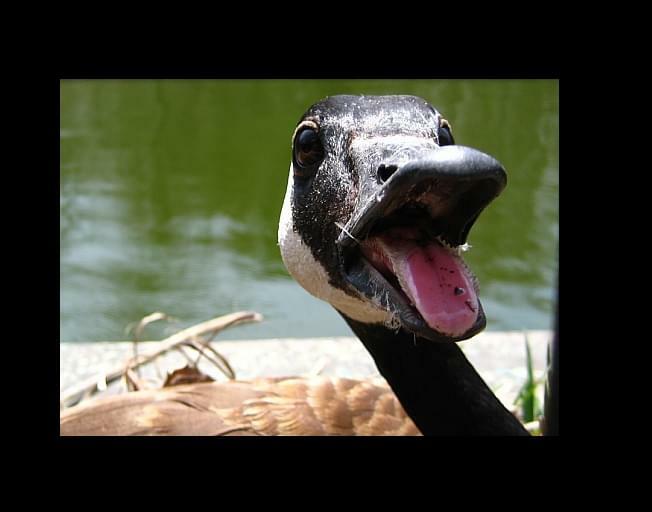 With the Canadian goose, females have the lower voice. This was me as a little kid (not really, but close), getting attacked by the “Snow Geese” that we raise on the farm. If a confrontation happens, it’s best to back off quietly, and give them their space because you don’t want to get into a fight with one. Just like any bird, they’re obsessed with food, but don’t feed them, because that just promotes confrontations. Best of luck!